This isn’t the first time. Naturally, she is all for the so-called palestinian “Right of Return”, which would result in Israel’s destruction. Indeed they have. The idea that opposing jihad mass murder and Sharia oppression of women, non-Muslims and others would be stigmatized and marginalized to the degree that it is today is breathtaking. 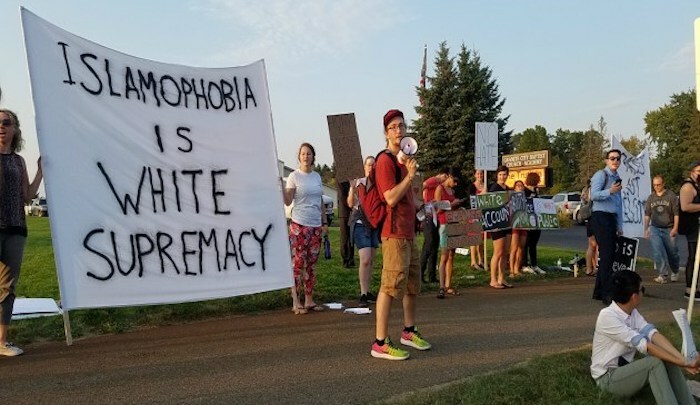 Most people now take for granted that any negative statement regarding Islam, even criticism of jihad terrorists, is “Islamophobic” and to be shunned and silenced. And so the advancing jihad is essentially unopposed; most people are afraid to say a word. And the social media giants are steadily choking off all criticism of Islam; even MasterCard and Discover have now begun denying their services to those who dare to violate Sharia blasphemy laws. The Labor Party apparently seeks to extend the reach of section 18C of the Racial Discrimination Act to cover religion. Chris Merritt, legal affairs editor of the Australian newspaper, reports that Labor is considering a plan to extend the reach of litigation based on section 18C to include people claiming they have been offended or insulted because of their religion. In other words, this party wishes to establish ‘Sharia law by stealth’ in order to prevent people ‘offending’ Islam. The proposal comes from Dr Anne Aly, a Muslim Labor MP from Western Australia. Labor’s federal Attorney General Mark Dreyfus has confirmed that Labor would support such changes to 18C. Its a guilt-based shakedown operation. Have a look at this disgusting hateful thing they have done in Newtown Sydney. The left now think it’s appropriate to draw someone doing a Nazi salute whilst calling everyone a Nazi. We have contacted Newtown Police and Sydney City Council. We urge everyone to do the same. It’s behind the Botany View Hotel in Newtown. “I urged your predecessor repeatedly to honour his commitment to clean energy,” he told the state dinner. “We have already made financial commitments, some $200 million already invested, $100 million further, here and in Fiji alone most recently. “And into the future we will continue to fund these resilient works in the Pacific, and we’ll do it directly. It’s a guilt-based shakedown operation. Somebody please tell me what is really wrong with “White Supremacy” I can name two once proud and successful African nations which are now shitehole corruption cesspits now that they are under black rule.